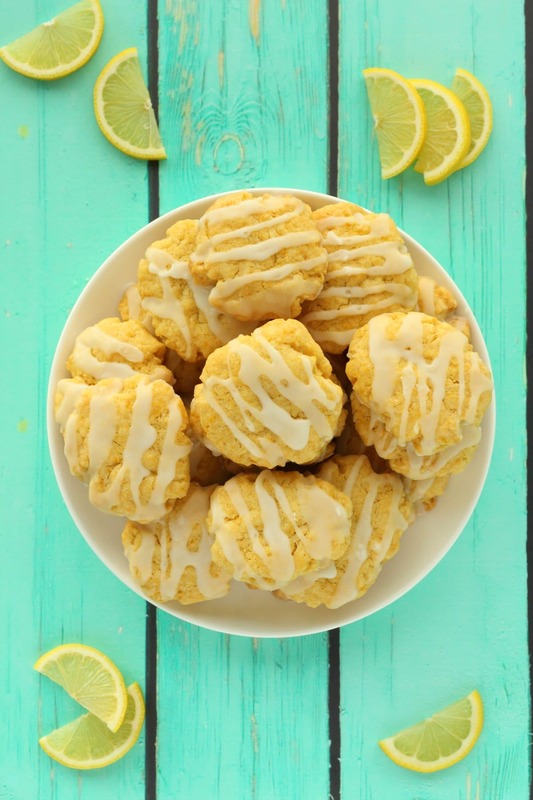 I absolutely love all things lemon! 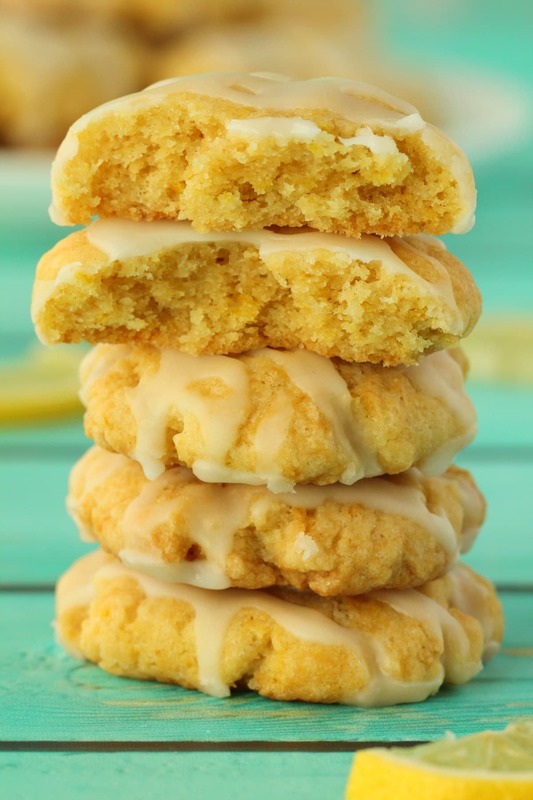 So these vegan lemon cookies are right up my street. There’s something about the tanginess and light and refreshing taste of lemon that just goes so well with sweet desserts (like lemon cupcakes, lemon cake and lemon pound cake, ooooh yes!). 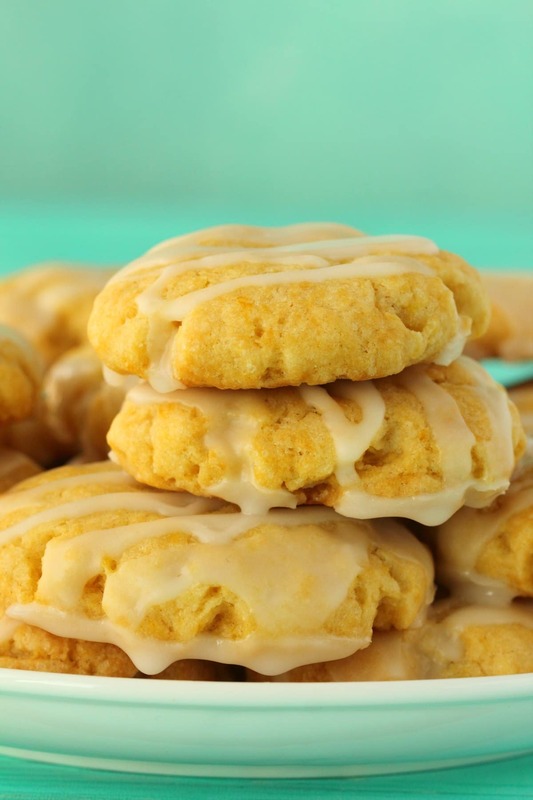 And these cookies are soft and buttery with just enough lemon flavor to really pop! 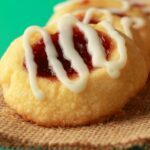 This is a simple 8-ingredient recipe for the cookies and an even simpler 3-ingredient recipe for the glaze. 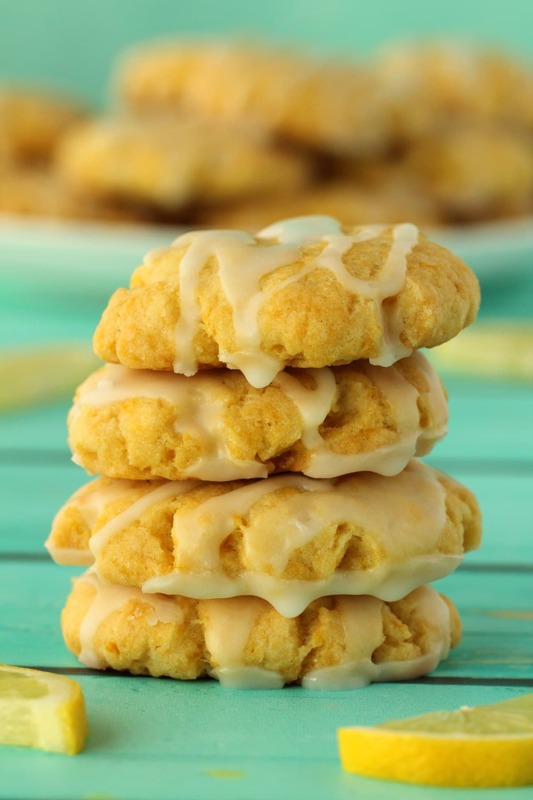 The glaze is totally optional, but recommended, it really makes that lemon flavor shine! You start off by creaming together some vegan butter and sugar and then adding in some lemon extract. Then you add some flour, baking soda and salt and mix in until very crumbly. Add in some lemon zest. Then you add some soy milk and mix again. At this point it will feel like this will never make a cookie dough, it will feel way too dry. But get in there with your hands and next thing you have a nice big ball of dough. The dough is dry, but don’t worry the cookies are definitely not! 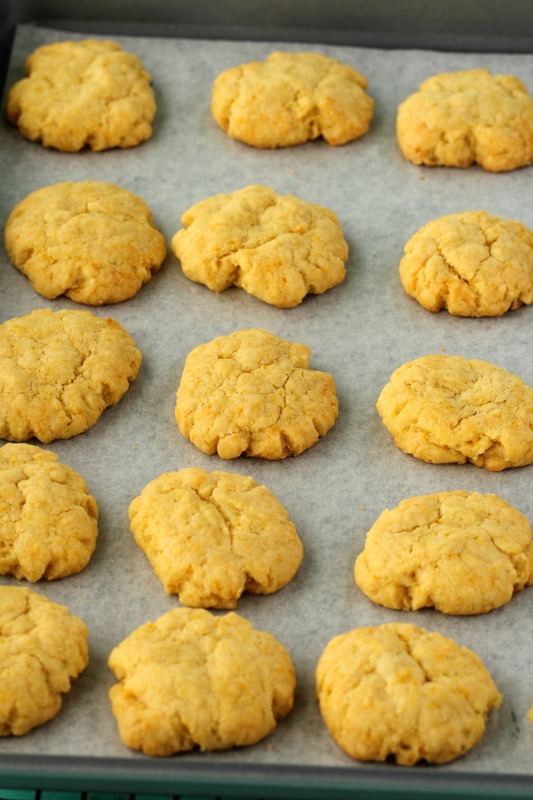 Break off pieces of dough and roll them into balls and then flatten them. You can flatten them with a fork, or by placing a square of parchment paper on top of the balls and then pressing down on it with the base of a glass. I tried it both ways and the end result looked identical. And then you bake them for 12 minutes! When they come out of the oven they will be very lightly browned on top but still very soft in the middle. Let them cool on the tray and as they cool they will firm up. When they’re completely cool, then drizzle on the delicious lemon glaze. 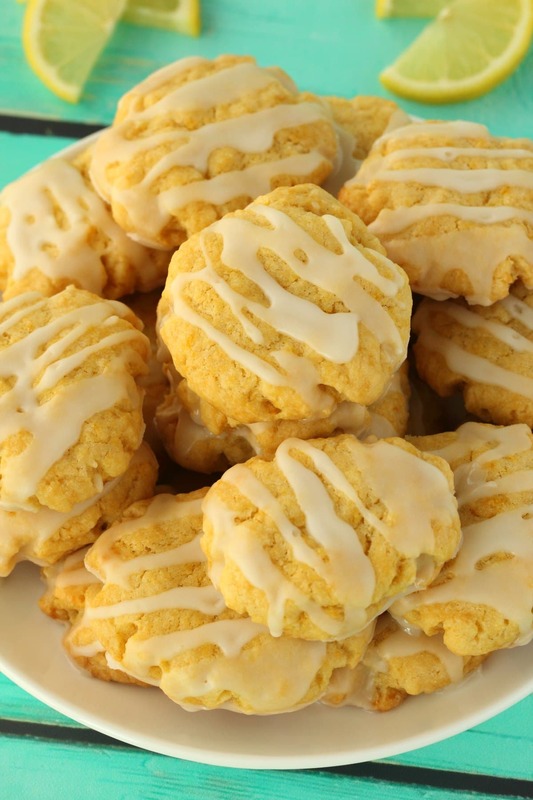 And there you have it, delicious vegan lemon cookies! 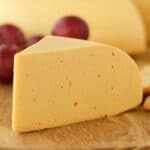 Keep them stored in an airtight container at room temperature for a few days or in the fridge for up to a week. 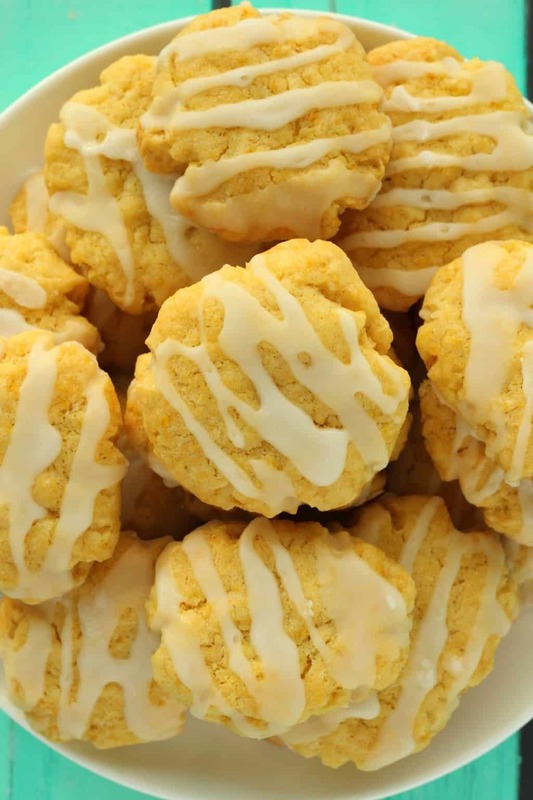 So please let us know what you think of these vegan lemon cookies in the comments and please rate the recipe too! Sign up to our email list for a fabulous (and free!) dinner recipes ebook containing 10 awesome recipes and to stay updated with all our latest recipes posted to the blog. 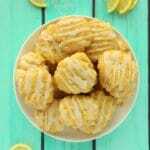 Vegan lemon cookies with a deliciously tangy and fresh lemon flavor and a soft and buttery texture. 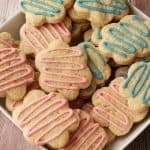 Super easy recipe with perfect results. 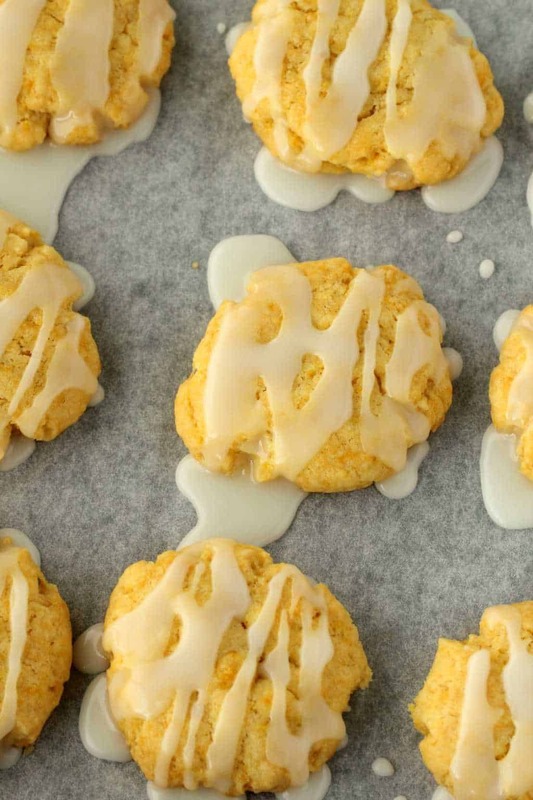 Add the vegan butter and white sugar to the bowl of a stand mixer and cream them together. Add in the lemon extract and mix in well. Add the flour, baking soda and salt to a bowl and mix together. Then add the dry ingredients in with the wet ingredients and mix in by hand (don’t use the electric mixer for this part). Mix until crumbly. Add in the lemon zest and mix in. Then add in the soy milk and mix in very well. It will seem like it is too dry to form a dough, but get in there with your hands until it does. Only add more soy milk if you absolutely have to. 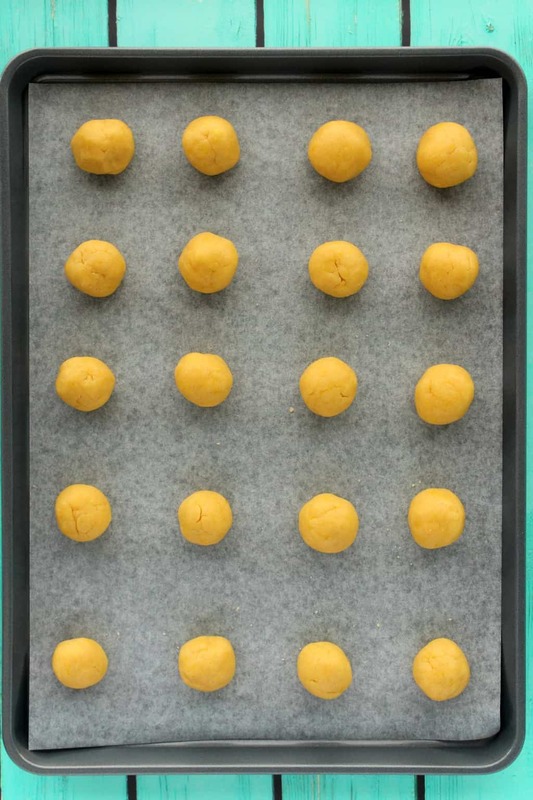 Break off pieces of the big ball of dough and roll them into balls and place onto a parchment lined baking tray. Aim to get 20 balls. Then flatten the balls either with a fork or by placing a square of parchment paper over a ball and flattening with the base of a glass. Place into the oven to bake for 12 minutes. When they are done they will be lightly browned on top but still very soft in the middle. 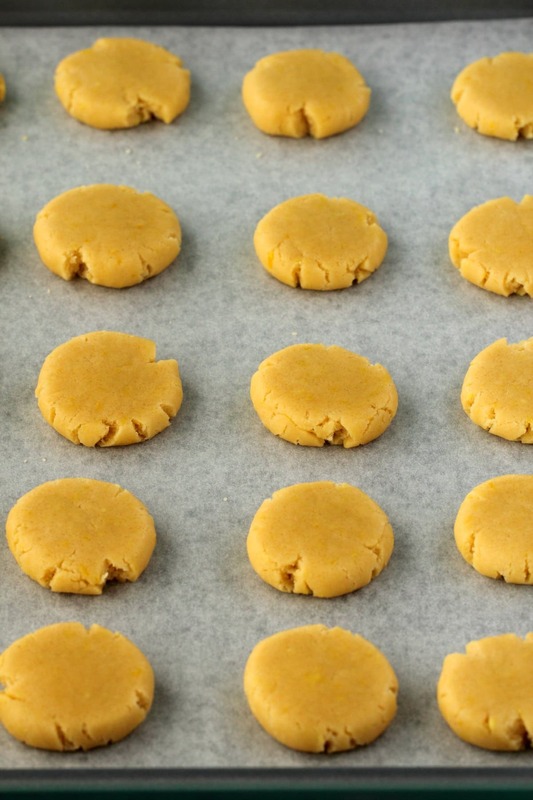 Allow to cool on the tray and they will firm up as they cool. Prepare your lemon glaze by adding the ingredients to a bowl and mixing in with a spoon. 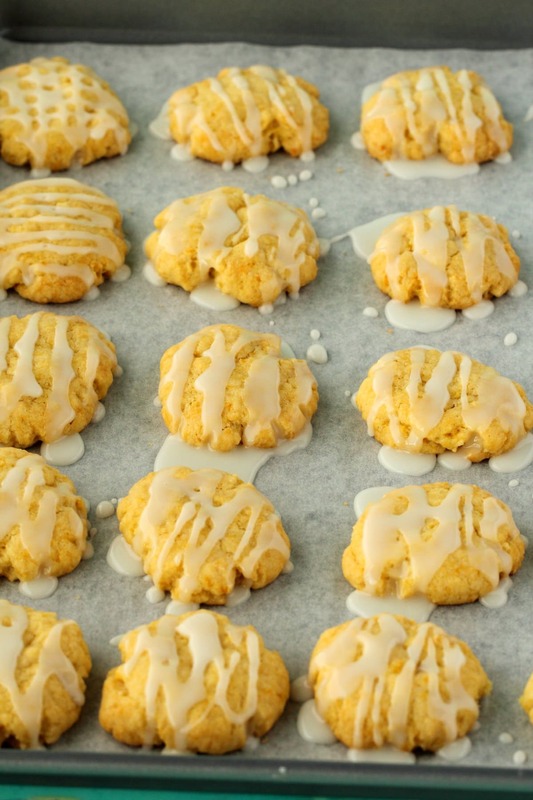 When the cookies are completely cool, use a teaspoon to drizzle the glaze over the cookies. *1 Tbsp of lemon zest is roughly what you’d get from 1 lemon. *You can substitute a different non-dairy milk such as almond milk if you prefer. 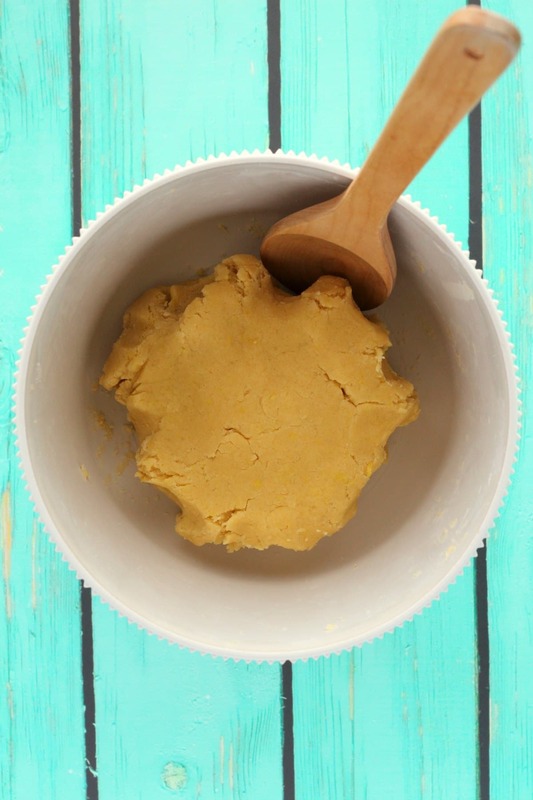 Previous Post: « Peanut Butter Banana Ice Cream – 2 Ingredients! 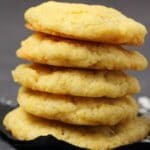 The lemon flavour adds a special flavour to these cookies! Can’t go wrong with LEMON! And these look award-winning to me! YUM! Just curious. 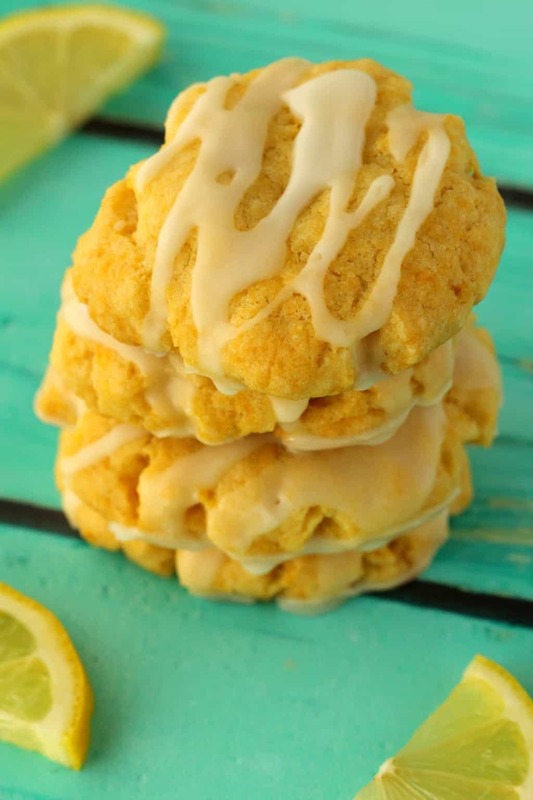 Is it possible to replace the lemon extract in the recipe with lemon juice and what would the proportion be? I am curious if you have tried this or have any experience doing it. 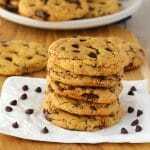 Another great cookie recipe from you, really delicious and simple to make. You do not have mention bringing the vegan butter to room temperature first. is this a step that you recommend or find necessary? Thank you!! Coconut oil would likely be okay, I have no idea about cacao butter for this, but I would be hesitant to try. 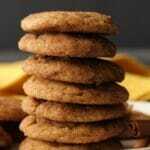 Others have substituted coconut oil for vegan butter in our cookie recipes and been successful so that should be fine. 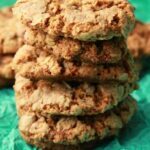 You could also try making a coconut oil based homemade vegan butter we have a recipe that works great for cookies! I did make these last night and they are yummy. 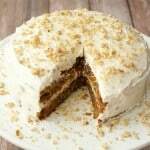 Thank you very much for your wonderful recipes! 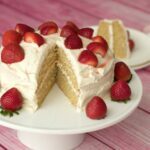 Can I substitute the white sugar to coconut sugar? 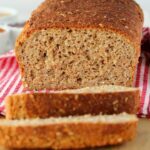 can you sub gluten free flour for regular? THANKS! I will let you know!! !